We will turn a Station 69 hook and ladder firetruck into a time machine as we take an historical look at fire use and fighting from the Native Americans to recent history. The Topanga Historical Society welcomes L.A. County Fire Captain, Ret., Dave Boucher to the upcoming quarterly meeting Wednesday, July 20 at the Topanga Community House. Boucher is also the department’s official historian, a position created for him after the publication of this book, Ride the Devil Wind in 1991. Boucher began his career as a volunteer fire-fighter in 1954, served in Korea, and on his return became a professional when he joined the Pasadena Fire Department. Eight years later he found his way to the LA County Fire Department where he served until he retired in 1995. Throughout the decades, fires have challenged and taught firefighter’s effective ways to protect our canyons. Boucher is struck by the uniqueness of Topanga. Most canyons burn up both sides, but because of our topography, our fires seem to occupy just one side of the canyon – a relief to firefighters. As an historian, he will present a time-line of major fires since the 1960’s in the county and innovations in equipment and strategy for fighting them. Did you know that LA County first developed the drop-tank helicopter now used nationwide? Bucher stays active as the official historian by giving talks and writing for two newsletters each month. But before we hear from Boucher, our own board member, Eric Dugdale, will talk about the very early days. 6,000 years before the Egyptians built the Pyramids, First Americans related to the Chumash were living in our Canyon, and dealing with fire. Controlled burns let them grow the grasses they liked, and protected the Oaks, an important source of food. Fire heated their sweat lodges, steam bent the planks when building their canoes. Smoke signals communicated across hilltops at Solstice. Burning handfuls of sage is still important in ceremonies of purification. 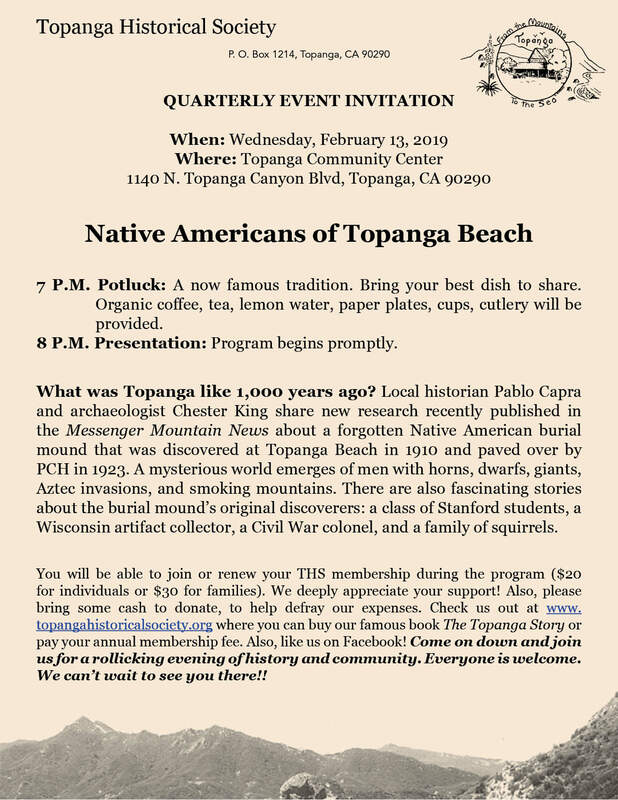 Pease join us at the Topanga Community House,1440 N. Topanga Canyon Blvd., for the Topanga Historical Society quarterly program, Wednesday, July 20 for this informative talk. The program is open to all (adults & kids) and free of charge. Bring your best dish to share with our now famous pot-luck at 7 PM. There will be organic decaf coffee, tea, & lemon water. The THS will provide dinnerware and serving utensils for your dish. The program starts at 8 PM. At the end a collection will be taken to help defray the fee for parking and clean up personal The updated Topanga Story will be available for purchase and participants will have an opportunity to become, if not already, Topanga Historical Society members for $20 individual or $30 for a family. Topanga Corral Music Reunion- SOLD OUT!! The Topanga Historical Society is taking you in a time machine back to the Topanga Corral, for their annual potluck picnic on the old Corral site at Horseshoe Bend. Music will live again on Tuesday evening, October 27th for one magical night only. The old posse is coming together for this musical reunion. Gracing the Corral stage will be Taj Mahal, Debbie Ryder, and Little Feat’s Fred and Miles Tackett. Greeting the old posse will be Marie Janisse, keeper of the door back in the day. Space is limited and the demand will be high. To attend this historic gathering you must be a member of the Topanga Historical Society. To become a member, or to renew your membership, go to Books and Membership. Sign up for an individual membership for $20 or a family membership for $30. Once you are a member you can make a reservation for this event . Be sure to follow all the indicated steps and read everything. The reservation list will be at the entrance. A $20 door fee that we will be collecting to defray expenses, will be bucketed (paid) online ahead of the event at the THS website. T-Shirts from 1971, with the original Corral design, will be re-printed and available for sale this one night only. For T-shirt purchases, orders will be taken ahead of time at the Books and Membership and the tee’s can be picked up when checking in for the event. No t-shirt sales will be made at the event, therefore in order to get one of these epic T’s you MUST pre-order & pay online beforehand. The fun begins at 4PM with our traditional picnic potluck. If possible, please arrive @ 3:30PM so we can organize the dishes and prep the tables before the potluck begins. Bring your best dish to share. Paper plates, cups, cutlery, coffee, tea and lemon water will be provided. Also, in Topanga style, bring a lawn chair, pillow, or blanket and dress for the evening chill, since we will be outdoors. Live Music will go on from 6 – 9 PM. The Topanga Corral is at 2034 Topanga Cyn. Blvd. Parking will be along the street and, remember to have all tires well within the white line (off the street). Don’t forget a flashlight! This event will fill quickly!!! Don’t be left out because you waited too long to make your reservation! **Please remember, EVERYONE needs a paid reservation in advance to attend. Only join THS if you want to be a member, not just for this event. Reservations are limited. Reservations will be given out first to volunteers and existing members as of October first, 2015. Then to new members as received. (volunteers need to be members and to make reservation online). Family memberships cover two adults at same address and two children at that address. Each person needs a reservation for the event. Reality check: This is an important, fun event. A small number of people are all volunteering their time and energy to make it happen. Big thanks to the volunteers, musicians and our speaker as well. THS will have to pay for the event expenses, most up front. That is why we are not offering rain checks or refunds. If you are okay with that come on in and join us. We are doing it for the community. *You must be a member to make a reservation. 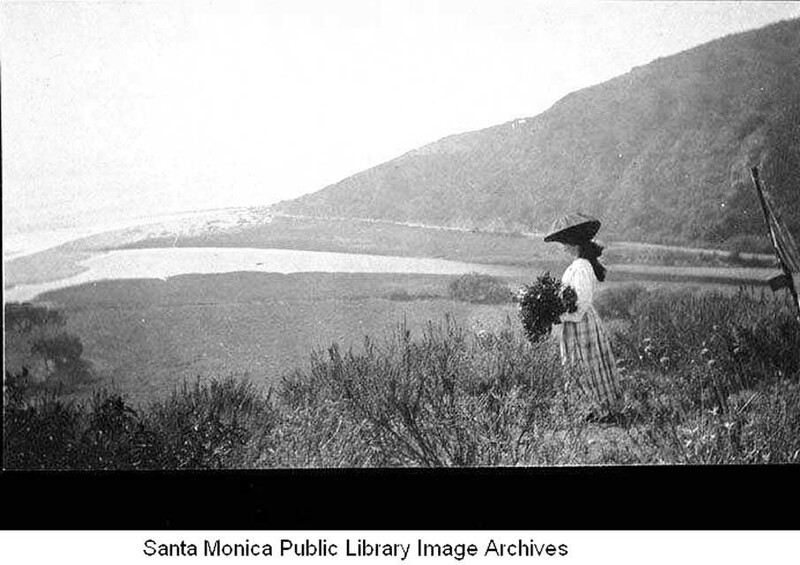 The Topanga Historical Society Digital Archive is running in closed beta test. To participate as a volunteer, please register.